Scinor provides NTPL with the most sophisticated UF modules; all Scinor UF modules utilize the Thermally Induced Phase Separation (TIPS) technology. The TIPS technology results in membranes with high chemical tolerance and mechanical strength, incomparable permeability, and complete rejection of solids and waterborne pathogens. 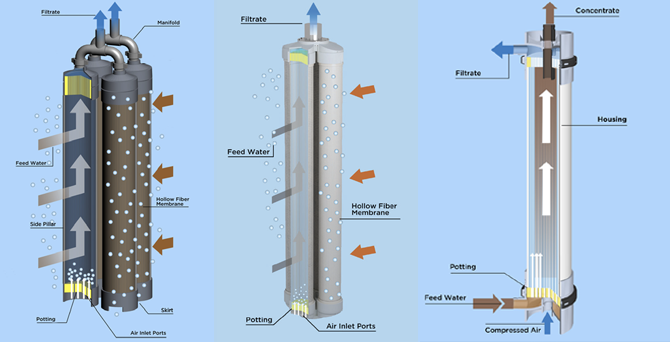 Ultrafiltration (UF) technology is one that is utilized during tertiary treatment of wastewater management. UF is a physical screening process that uses pressure to separate liquid through ultrafiltration with varied pore sizes. the tiny pores can effectively reject suspended solids, colloids, bacteria, microorganisms, algae and part of organic substances from wastewater. In comparison to other traditional multi-media filters, UF has lower operation cost and water filtration cost per ton and is popular in many fields. NTPL is currently procuring this technology from a company in China, Scinor.